Thomas is set to perform a one-hour set to headline the always incredible Moogfest, this year being held in Durham, NC from April 25-28th with an amazing lineup of talent. Dolby will make three appearances at Moogfest, including a live performance and a two-way interview with Buzzfeed News Sr. Investigative Reporter and 2018 Pulitzer Prize finalist Jason Leopold. Dolby and Leopold will converse on their shared passion of truth seeking among creative topics. A professor at Johns Hopkins University and digital audio pioneer, Dolby will also perform a musical set on Saturday evening at the Carolina Theatre combining his stylized use of set, visuals and music for enhanced storytelling. Dolby will open the evening with a visual chronicle of how his songs came into being through live projections of his audio workstation as the individual layers are added to form the entire song as its performed. Thank you for all the years of music and wonder, now make a wish and blow out those candles! Career compilation Hyperactive coming from BMG’s Masters Collection series on July 27. BALTIMORE, Md. 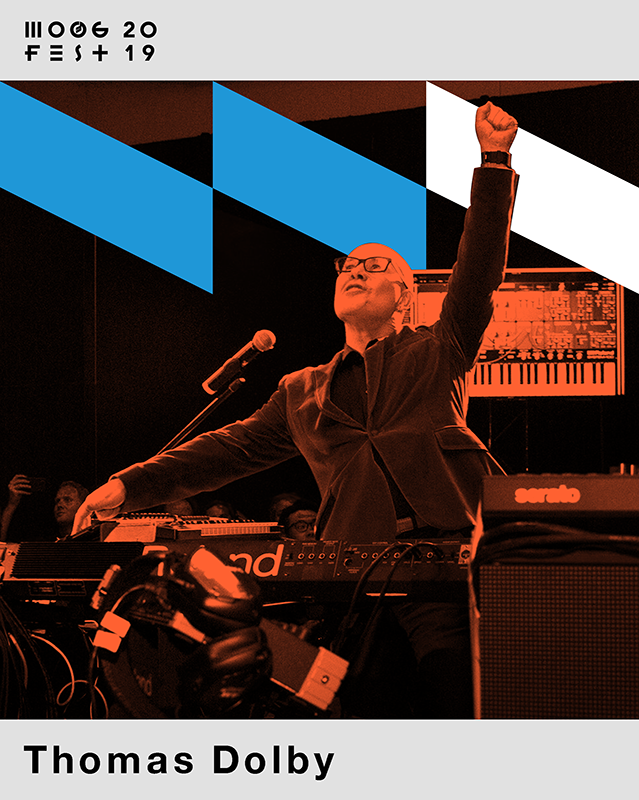 — Thomas Dolby — musician, video director, author, and now a university professor — is set for a short U.S. tour in July and August 2018 with a show titled An Evening of Music and Storytelling With Thomas Dolby. Sun Aug 5th—VENUE CHANGE: The Space Ballroom (tickets) All previous tickets for the State House will be honored. In this intimate solo show I will deconstruct half a dozen of my favorite songs, telling the story behind their creation while breaking down the beats, chords, keyboard parts, and synth sounds, looping and layering them until I’ve recreated the entire song. My simple rig is a couple of keyboards, a drum pad, and a MacBook, the output of which is projected on a screen behind me, so the audience can see ‘under the hood’ while I build and perform each piece. Congratulations to Thomas on his Roland Lifetime Achievement Award! 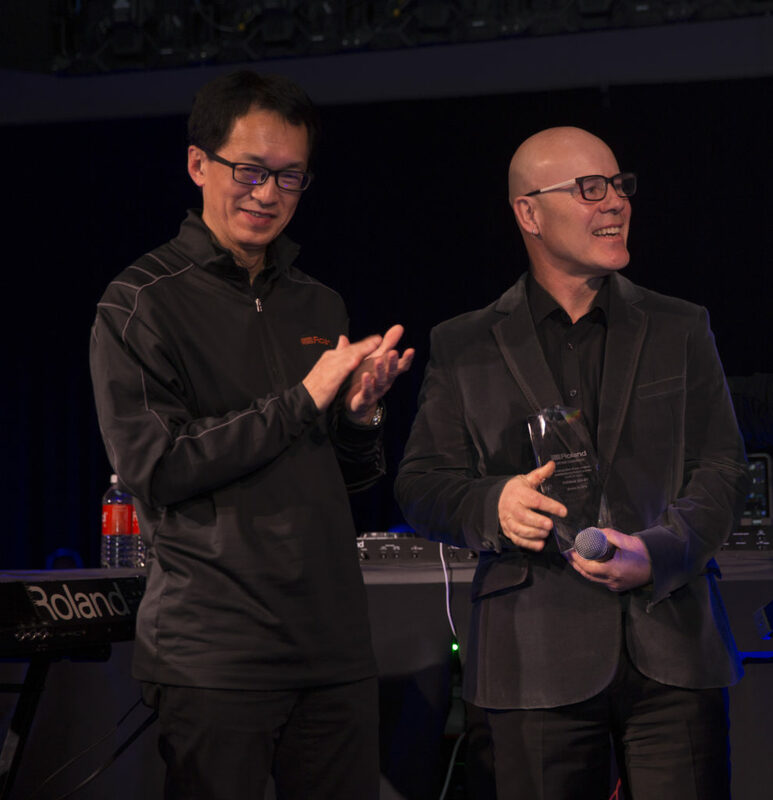 Roland and BOSS presented their third-annual Lifetime Achievement Awards to synthpop and electronic music pioneer and solo artist Thomas Dolby (Roland), and guitar virtuoso, artist, and producer Steve Vai (BOSS). The Roland/BOSS Lifetime Achievement Awards recognize individuals for their invaluable contributions to the music industry while using Roland and/or BOSS gear throughout their careers. The gala event was attended by artists, musicians, and leading journalists from the music industry. Read the press release! Thomas’ book is one of Amazon.com’s picks for best books in 2016! Have you got yours?